In addition to all of the cooking I did this weekend, I performed a much needed culling and inventory of our freezer. While doing so, I located a little zip top bag filled with a cheese and herb mixture, left over from the stuffed squash blossoms I never got around to blogging. I pulled it out of the freezer to thaw, with every intention of using it as a stuffing for fresh pasta, but the pasta never materialized due to this darn Summer cold that I am *still* fighting, so there it sat, in the fridge, waiting to be used or tossed. And you know how much it pains me to waste food. But we had chicken breasts, separated out from the Pat’s Pastured bird Mike took apart on Tuesday. They were just thick enough for me to make a pocket and stuff them, so stuff them I did, giving them a quick dip in seasoned Wondra before searing them in a bit of olive oil. 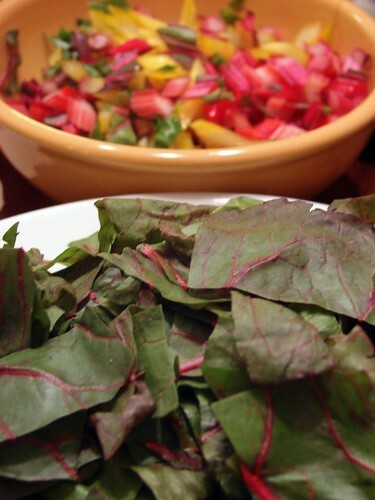 While the chicken cooked, I dug out a bunch of rainbow chard – so dazzling at the market that I couldn’t resist bringing it home, but definitely on its last legs. I separated the leaves from the stems, chopped each finely, and sautéed them in olive oil until tender. When the chicken was browned and cooked through, I set it aside to rest under foil and got to work on a quick pan sauce, pouring off the olive oil from the pan I had cooked the chicken in, reducing about half a cup of the chicken stock Mike made on Tuesday, scraping up all of those good crispy bits from the bottom, adding a dozen or so halved heirloom cherry tomatoes and the leaves from a few branches of summer savory. 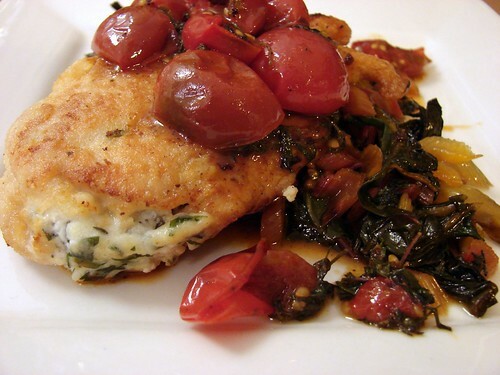 When the tomatoes were soft and wilted, the sauce was done, and plating was simple: a bed of chard, a chicken breast, and the sauce spooned over the top. This dinner was simple, tasty, and a good use of leftover odds and ends we had around. just wonderful. looks like a great dinner. thanks for the reminder about wondra. i need to pick some up. you could roullade that filling into boneless breast too alrthough i kinda like the whole pocket idea. Really good use of leftovers – looks wonderful. Inspirational. I think I’ll make some stuffed chicken breasts soon. Hello! I haven’t visited this blog in a while — the new format looks great! Using stuff from the freezer is something that gives me such a feeling of accomplishment, so I love the thought of this meal. I would probably never be brave enough to stuff zucchini blossoms, though, but that’s another story! really really beautiful. you look like you did your stuffing perfectly too – not watery at all! Your food looks absolutely AMAZING! I love reading your blog and looking at the pictures!! I enjoy cooking myself and seeing the things you make are so inspirational. I will definitely continue to read this blog. And I’m now craving some stuffed chicken breasts…maybe I’ll make those sometime soon.